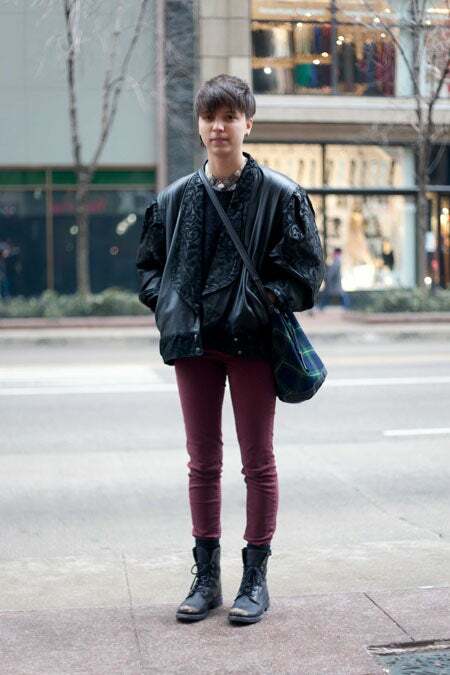 Street Style: Art Students Dress Well, Duh. Who she is: Eryn, a recent transfer to The School of the Art Institute of Chicago from Parsons, and she's majoring in Interior Architecture. Where we spotted her: On State Street in the Loop buying materials for class at Blick. Why we love her: Sometimes to catch a great street style photo, you just have to stand in between a Downtown college campus and an art supply store. And that’s exactly where we caught our stylish friend Eryn here. She’s a recent transfer from Parsons in New York, but we’re glad she’s decided to grace her fashionable presence at the School of the Art Institute in Chicago. We love how effortlessly she paired her maroon LF jeans with an otherwise all black ensemble, defying the stereotype that all art students only wear black. We’re super jealous that we can’t purchase the jacket that she bought in Williamsburg, but luckily for her there will be few artists on State Street looking the same.